Beginning sometime in June, and generally peaking in early July, the Juniper and Piñon dominated High Chihuahuan Desert landscape surrounding Casitas de Gila Guesthouses often delights our guests with an extravagant Welcome-to-Summer white and golden flowering of the ubiquitous Yucca, Sotol, and Beargrass plants that thrive across this arid terrain. The magnitude of the flowering is a function of several factors, but primarily reflects the amount and timing of the previous Winter and Spring precipitation. It was obvious that all of the various factors were optimum over this past Winter and Spring because this year’s display was simply magnificent! No matter where one looked, the brilliant white flowering plumes of the Soaptree Yucca (Yucca elata) atop their 6-to-12 foot stalks, and the golden plumes crowning the soaring 10-to-16 foot stalks of the Sotol (Dasylirion wheeleri) could be seen in glorious contrast against the deep green of the Juniper trees or the cobalt blue of the New Mexican sky. 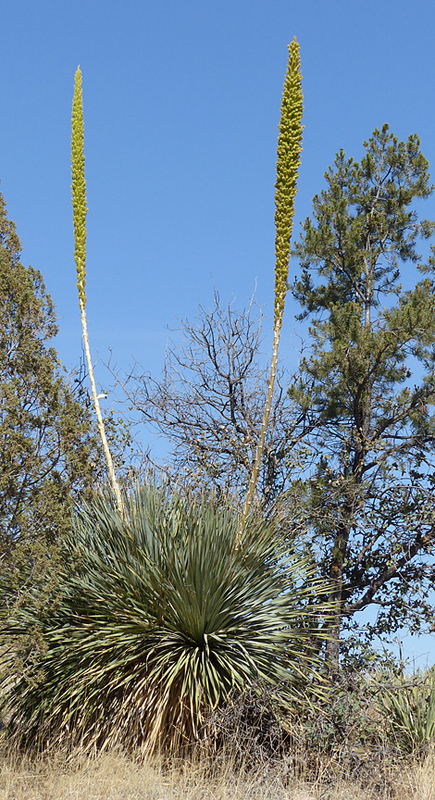 In 1927 the New Mexico Legislature established the blossom of the desert Yucca plant as the State flower. Only the Genus was specified, allowing the designation to apply to the several species of the plant growing within the State. Early settlers referred to these lovely flowers, which are found in all sectors of New Mexico, as “Our Lord’s candles” — “las lamparas de Dios” or the lamps of God. A magnificent flower at any time, for many it is when viewed on a full moon night, when the snow white plumes appear to float suspended in space high above the desert floor, that the ethereal beauty of the bloom is best appreciated. There are some 40 to 50 species of Yuccas in the Americas and the Caribbean, all of which share the common characteristics of a basal, rosette, or circular arrangement of sword-shaped leaves and clusters of white or whitish flowers set at the top of a tall stem or stalk. 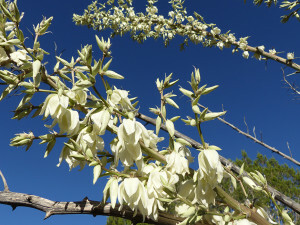 Here at the Casitas there are two species of Yucca: the abundant Soaptree Yucca (Yucca elata) and the much less common Banana Yucca (Yucca baccata). Soaptree Yucca along the road at the Casitas that’s bent by the strong prevailing west winds. 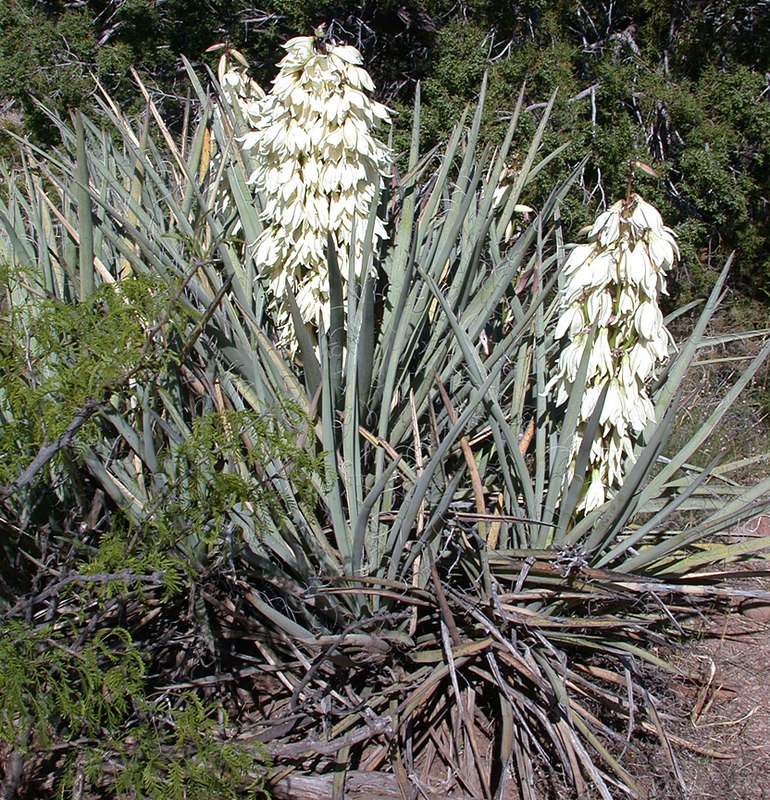 The Soaptree Yucca (Yucca elata) has narrow, 0.25 inch, sword-shaped leaves 1 to 3 feet long, with needle-sharp tips, and grows to heights of 15 feet or more with a small diameter, occasionally branching, cylindrical trunk that is generally covered with a dense mat of dead leaves. Following the flowering phase, which consists of an inflorescence of large 1.25 to 2.25 inch bell-shaped flowers, the fruit appears in the form of numerous, large, three-chambered seed pods or capsules, two to three inches long and an inch in diameter. Each of these chambers contains two poker-chip-like stacks of flat black seeds. Eventually these pods dry and crack open, releasing the seeds to be spread by wind, surface water runoff, birds and animals. 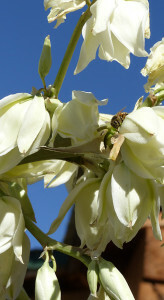 Various insects love the nectar of the Soaptree Yucca, but the flower is only pollinated by a species of the Yucca Moth. 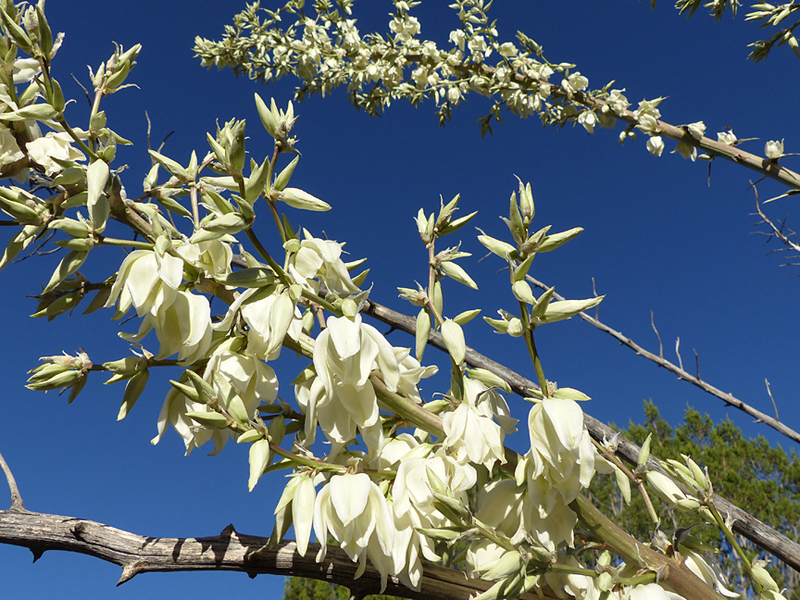 Honeybees love Soaptree Yucca flowers but do not pollinate them. 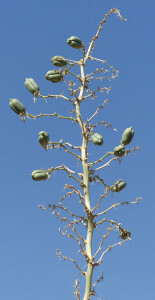 The fruit of the Soaptree Yucca is a three-chambered pod or capsule. 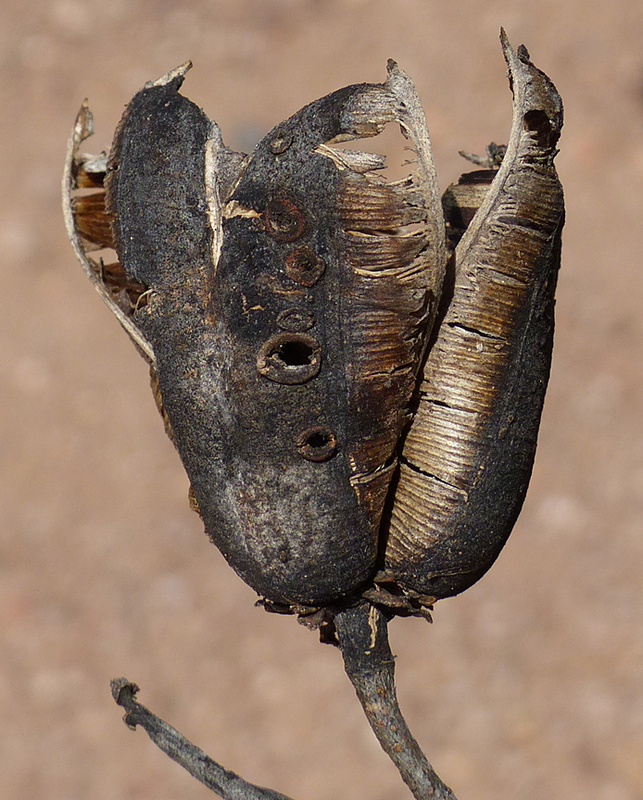 Opened Soaptree Yucca seed pod showing three-chambered structure. 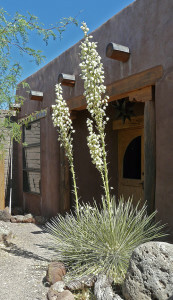 Flowering Banana Yucca near the Gallery at the Casitas. The Banana Yucca (Yucca baccata) grows close to the ground, with only a short trunk, if present at all. The sword-shaped leaves are 1.25 to 1.5 inches wide, up to 3.5 feet long, with curled fibers along the margins, and needle-sharp tips. Height of the plant, including both the leaves and flower stalk rarely exceeds 4 or 5 feet high. While the flowers of the Soaptree Yucca and Banana Yucca are similar, their fruits are quite different. 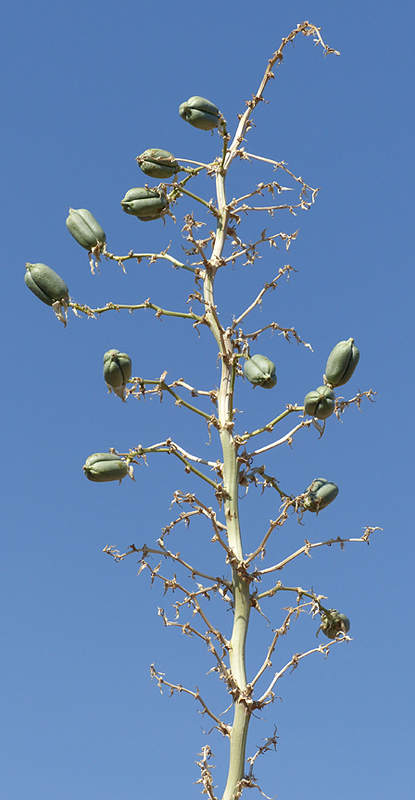 Unlike the more woody, tough, chambered seed pods or capsules of the Soaptree Yucca fruits, the Banana Yucca fruits are large, 3 to 6 inches long and 2.5 inches thick, fleshy, and soft and sweet when ripe. As a result they are much sought after as a food source by insects, birds, animals, and humans. Rarely do they reach ripening stage on the plant before being eaten. 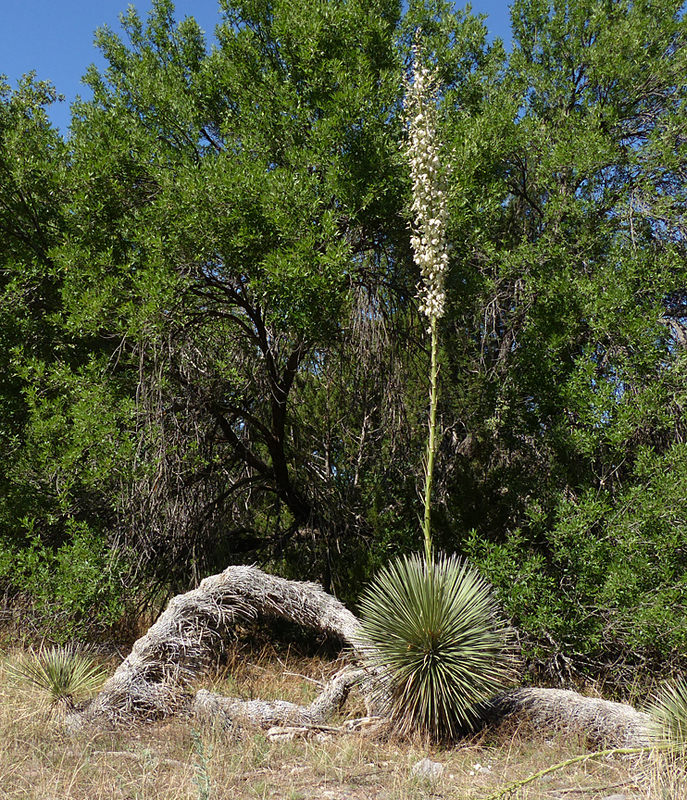 Like the Soaptree Yucca, the Banana Yucca is pollinated by a species of the Yucca Moth. Yuccas and Yucca Moths have been enjoying a romantic relationship for some 30 to 50 million years now. What has kept them together all those years makes for an interesting love story in intra-specifc relationships . . . 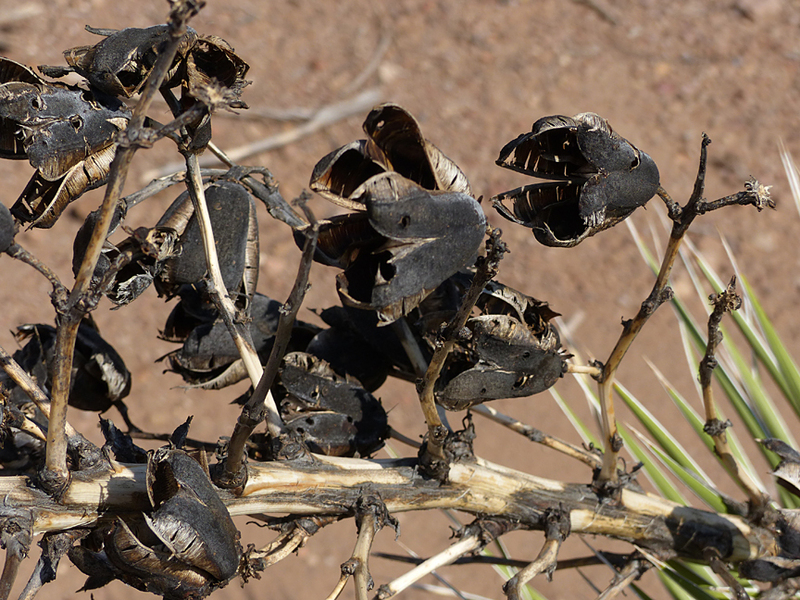 Seed pod of Soaptree Yucca showing hole where Yucca Moth larvae bored out prior to the drying out and splitting open of the seed pod. 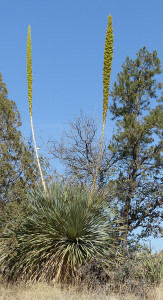 Yuccas reproduce by seeds produced from the pollination of the flowers. The flowers of Yucca plants are pollinated by three genera of the family of moths known as Prodoxidae. Certain species of two of these moth genera, the Tegeticula and the Parategeticula, have what is called an obligate pollination mutualism arrangement with particular species of Yucca. What this means is that certain species of Yucca are only pollinated by a particular species of Yucca Moth, an evolutionary development in which both species are mutually benefited, which, in this case, is by successful reproduction. For the Soaptree Yucca the mutualistic Yucca Moth is Tegeticula yuccasella1. In this torrid relationship, the female moth first deposits an egg in the flower’s ovary, after which, in a display of impassioned gratitude, she collects a large ball of pollen from the flower, two or three times the size of her head, and then inserts it into the stigma of the flower! After a week or so the egg hatches there and the baby moth larvae will munch on some of the seeds developing from the ovules. After a few weeks, the seed capsules begin to open, at which time the mature larvae now bores its way out of the capsule and tumbles to the ground where it bores down into the ground, forms a silken cocoon, and begins a long winter’s nap while waiting for next season’s Yucca flowers, at which time it will complete the cycle and emerge from the ground as a new Yucca Moth! The Banana Yucca and the Yucca Moth also have a obligate pollination mutualism relationship in which the romantic modus operandi of the moth, Tegeticula baccatella, is essentially the same as that of Tegeticula yuccasella. 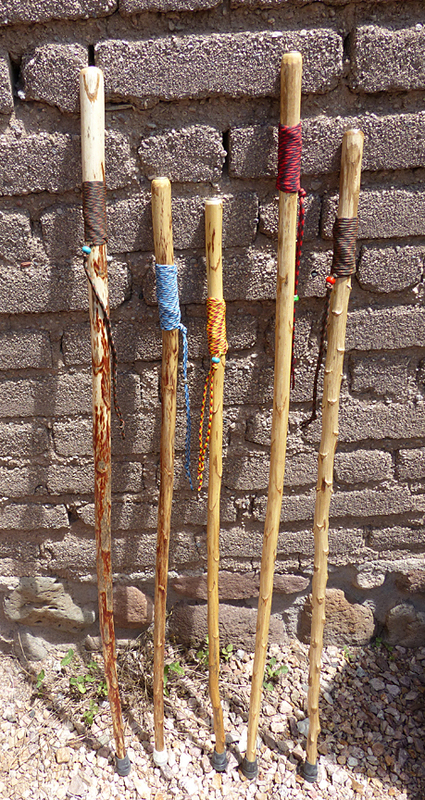 Dried Soaptree Yucca stalks are strong and light, a perfect combination for the handcrafted walking sticks made by Jeff Ross for the Gallery at Casitas de Gila. Today, all species of New Mexican Yucca are extensively used in xeriscaping because of their extremely low water requirements and their iconic Southwestern beauty. They are easy to grow and once established require virtually no maintenance. 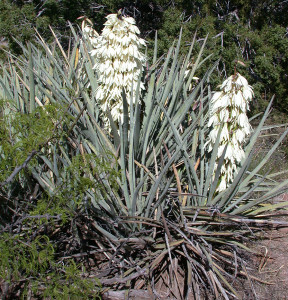 The flower stalks of the Yucca are extremely strong and light, therefore they make excellent walking or hiking sticks. 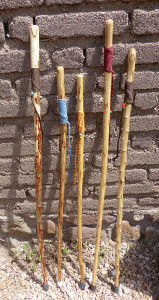 Here at the Casitas we provide them as walking sticks, and also use and decorate them as a Christmas tree in each Casita. Compared with other natural woods, Yucca as well as Sotol stalks have an exceptionally low ignition temperature. Consequently, they are excellent as drill and hearth or fireboard material for outdoor primitive friction fire starting using the plough, handrill or bow techniques as used by hunters, campers and practitioners of wilderness survival skills. The use of Yucca as well as Sotol stalks in various types of building construction was widely practiced by both Anglo and Hispanic settlers in the traditional architecture of the Southwest, from crude enclosures of various kinds to the unique latillas over vigas in room ceiling construction. Modern construction of traditional architecture continues such use. Sotol (Dasylirion wheeleri) is a common flowering plant of the arid Southwest found in both the Sonoran and Chihuahuan Deserts. 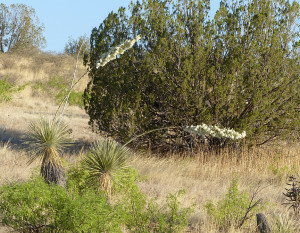 At first glance the plant can be mistaken for a Soaptree Yucca with its rosette or globe-shaped mass of 0.50 to 1 inch wide and 1 to 3 foot long sword shaped leaves radiating in all directions at the top of a short, 5 foot or less, brown unbranched trunk cloaked in dead leaves. Looking closer, however, one quickly sees or perhaps is unfortunate enough to feel that the leaves have dangerously sharp barbs or saw-tooth spines lining the leaf margins. Sotol replace the Soaptree Yucca above 5,000 feet elevation at the Casitas, and here along Turkey Creek road in the Gila National Forest. A phalanx of Sotol plants marching south down the mountainside along Turkey Creek Road in the Gila National Forest. Close up of flowering inflorescence of Sotol along the road into the Casitas. Honey Bee shows size of individual flowers! 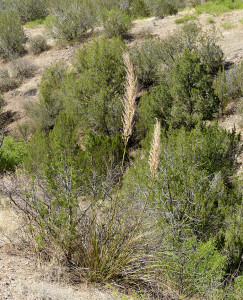 In the U.S. the Sotol plant is often used for xeriscaping like the Yucca, although its flower is less showy and and saw-tooth barbs on the leaves render it less friendly or desirable in gardens. The woody flower stalks are strong and light like the Yucca and are frequently handcrafted into walking and hiking sticks, and some practitioners of friction fire starting prefer Sotol over Yucca as a hearth or drill material. In Northern Mexico, mostly in the region of Chihuahua, however, Sotol is wild-harvested on a commercial scale where the hearts of the crown are baked, femented, and double-distilled to make a spirit liquor that is somewhat similar to tequila and mezcal. Beargrass (Nolina microcarpa) can be considered a distant relative of both Yucca and Sotol in that all three belong to the family of flowering plants known as the Asparagaceae, of which the namesake Genus Asparagus belongs, as well as our favorite Spring vegetable species, Asparagus officinalis. Plumes of flowering Beargrass catching the early morning Sun along Casita Flats Road. Clump of Beargrass. Fibers from the long, narrow leaves were used extensively by all cultures of Native Americans for cordage, basketry, and woven mats of all types. Many Native American cultures used flowering Beargrass for food, eating the emerging young flower stalks, the small fruit that followed the flowering, as well as the seeds that developed within the fruit. 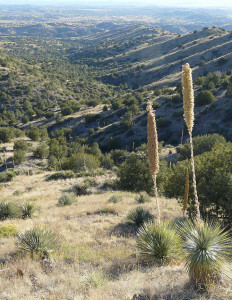 Beargrass is widely spread over the American Southwest and Northern Mexico. 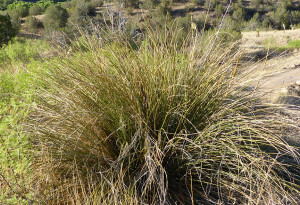 Its growth form is that of a globular clump of narrow, 0.50 inch, coarse, thick, wiry, and serrated grass-like leaves up to 4 feet long with dry, curled and string-like tips. 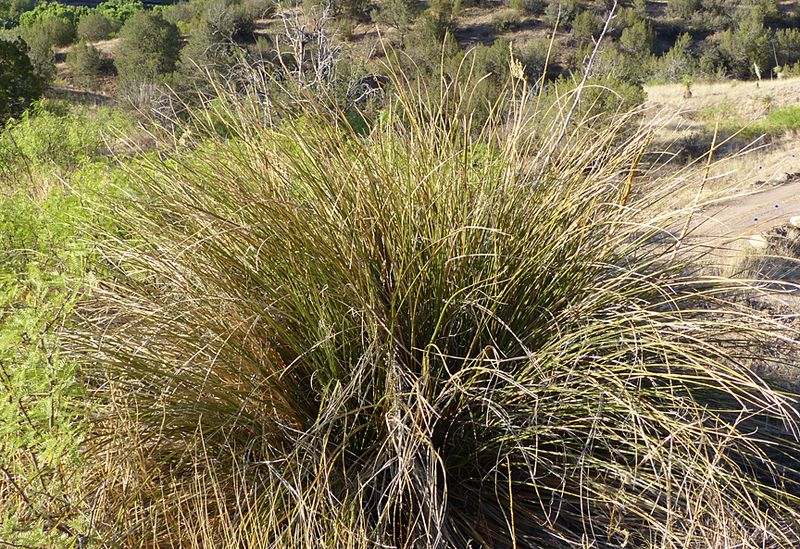 It grows in a variety of habitats from desert grasslands to juniper and piñon woodlands, and especially in overgrazed ranch land where the plant can attain dense concentrations with individual plant diameters of 6 feet and a height of 4 to 5 feet. Beargrass has no above ground stem or stalk, but rather an underground woody caudex from which the leaves and flower stalks grow. Like the Yucca and the Sotol at the time of flowering it puts up a stem or stalk 4 to 6 feet tall, at the top of which is found a much-branched inflorescence of tiny white flowers, 0.10 inch, which produce small green fruits and eventually encapsulated seeds. 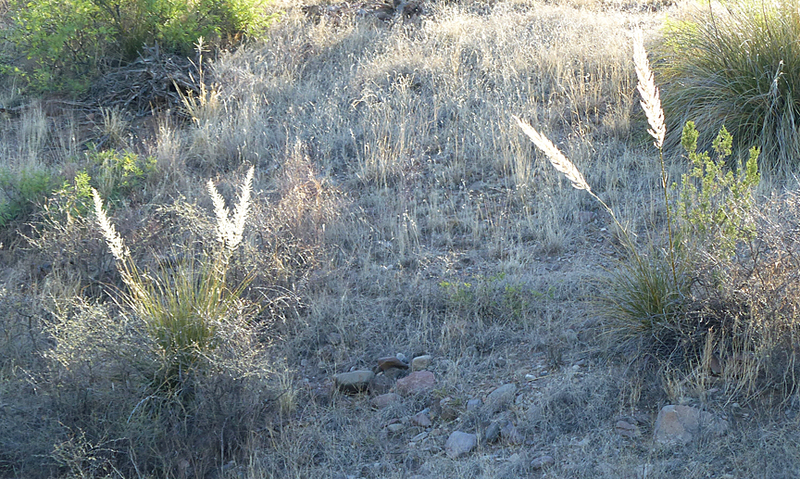 Beargrass is another southwestern plant mostly used in xeriscaping, particularly as an accent, in borders, and in stabilizing hillsides. 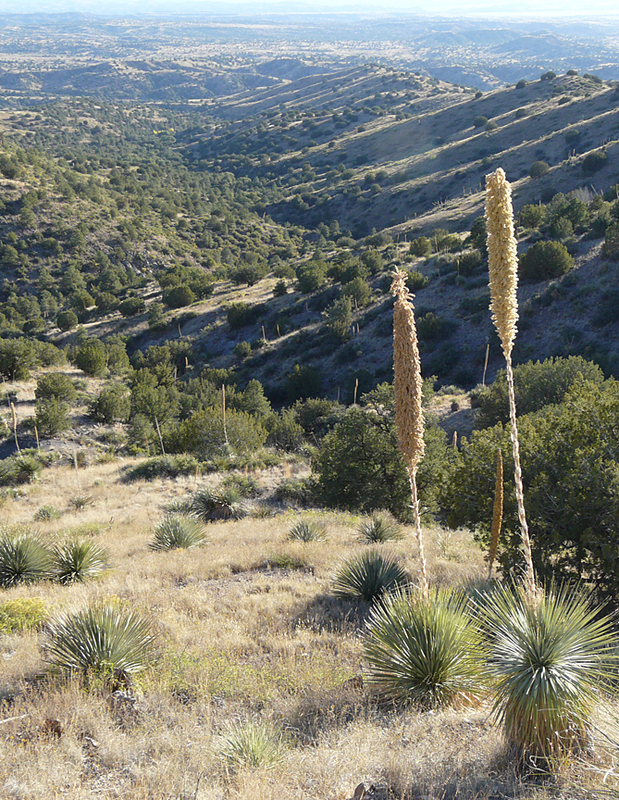 Clumps of Beargrass at the top of Telephone Mountain near the Casitas, looking northeast to the Mogollon Mountains in the Gila Wilderness. 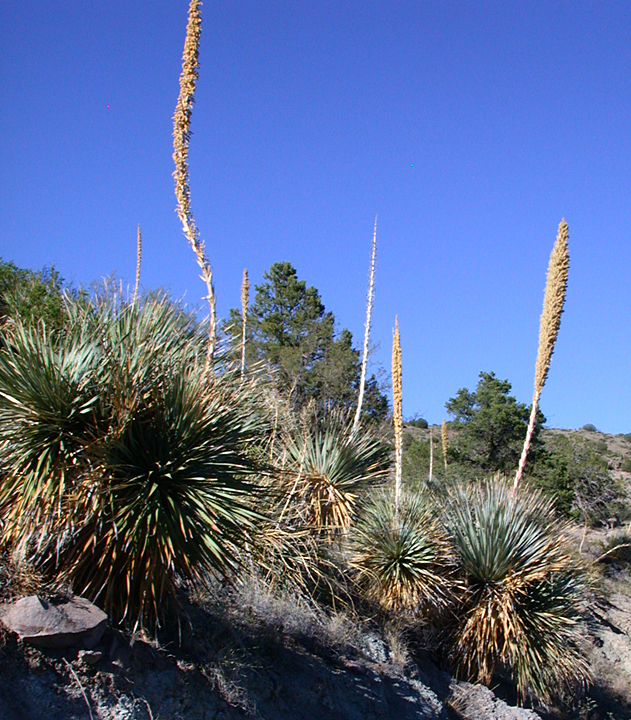 Various species of Yucca, Sotol and Beargrass were widely used by all cultures of Southwestern Native American Cultures from pre-historic to historic times. These three plants were extremely important to these cultures, serving as Nature’s grocery store, pharmacy, fabric shop, and hardware store in those times. Many of these uses and customs are still practiced today. This entry was posted in Apaches, Native Americans, native plants, nature and tagged beargrass, native plants, sotol, yucca, yucca moth. Bookmark the permalink.